"AND he said, A certain man had two sons; and the younger of them said to his father, Father, give me the portion of goods that falleth to me. And he divided unto them his living. And not many days after the younger son gathered all together, and took his journey into a far country, and there wasted his substance with riotous living. And when he had spent all, there arose a mighty famine in that land; and he began to be in want. And he went and joined himself to a citizen of that country; and he sent him into his fields to feed swine. And he would fain have filled his belly with the husks that the swine did eat; and no man gave unto him. And when he came to himself, he said, How many hired servants of my father's have bread enough and to spare, and I perish with hunger! I will arise and go to my father, and will say unto him, Father, I have sinned against heaven, and before thee, and am no more worthy to be called thy son; make me as one of thy hired servants. And he arose, and came to his father. But when he was yet a great way off, his father saw him, and had compassion, and ran, and fell on his neck, and kissed him. And the son said unto him, Father, I have sinned against heaven, and in thy sight, and am no more worthy to be called thy son. But the father said to his servants, Bring forth the best robe, and put it on him; and put a ring on his hand, and shoes on his feet; and bring hither the fatted calf, and kill it; and let us eat and be merry. . . . Now his elder son was in the field; and as he came and drew nigh to the house, he heard music and dancing. And he called one of the servants, and asked what these things meant. And he said unto him, Thy brother is come; and thy father hath killed the fatted calf, because he hath received him safe and sound. And he was angry, and would not go in; therefore came his father out, and entreated him. And he answering said to his father, Lo, these many years do I serve thee, neither transgressed I at any time thy commandment; and yet thou never gavest me a kid, that I might make merry with my friends; but as soon as this thy son was come, which hath devoured thy living with harlots, thou hast killed for him the fatted calf. And he said unto him, Son, thou art ever with me, and all that I have is thine. It was meet that we should make merry, and be glad; for this thy brother was dead, and is alive again; and was lost, and is found." Luke 15:11-32. It was to answer the accusation of the scribes and Pharisees to the effect that Jesus chose the companionship of sinners that he spake the parables concerning the lost sheep, the lost silver, and the prodigal son, and in these presentations showed that his mission to the world was not to make miserable, not to condemn and destroy, but to recover that which was lost. This was the reason he did not exclude himself from those who were sinful. These were the very ones that needed a Saviour. The Pharisees felt that they had need of nothing to make them spiritually perfect. They were just in their own eyes, and felt no need of repentance, and they condemned Christ in his work of seeking to save those who felt themselves lost and undone. The prodigal son was not a dutiful son, not one who would please his father, but one who desired his own way. He wished to follow the dictates of his own inclination, and was tired of counsel and advice from the father who loved him, and who only wished him to act in such a way that his happiness would be insured. The tender sympathy and love of his father were misinterpreted, and the more patient, kind, and benevolent the father acted, the more restless the son became. He thought his liberty was restricted, for his idea of liberty was wild license, and as he craved to be independent of all authority, he broke loose from all the restraint of his father's house, and soon spent his fortune in riotous living. A great famine arose in the country in which he sojourned, and in his hunger he would fain have filled himself with the husks that the swine did eat. This was the result that followed this youth's impetuous course. He did not know that the best place in the world is home; for the home atmosphere had become disagreeable to him, because he could not be as independent as he desired. Any place looked better to him than home. Evil companions helped to plunge him deeper and deeper into sin, and a false excitement was kept up, and he imagined that he was happy in being free from all restraint. He had no one now to say: "Do not do that; for you will do injury to yourself. Do this, because it is right." But when his means failed, and he was obliged to take time to consider, he found himself without the bare necessities of life; and, to make his situation more trying, a famine had come upon the land. Starvation stared him in the face, and he joined himself to a citizen of the place. He was sent to do the most menial of work,--to feed the swine. Although this to a Jew was the most disreputable of callings, yet he was willing to do anything, so great was his need. Miserable and suffering, he sat in the fields doing his task. Because he had been unwilling to submit to the restraint of home, he now had the place of the lowest of servants. He had left home for liberty, but his liberty had been turned into the lowest of drudgery. Where now is his riotous joy? Stilling his conscience, benumbing his sensibilities, he had thought himself happy in scenes of revelry; but now, with money spent, with pride humbled, with his moral nature dwarfed, with his will weak and unreliable, with his finer feelings seemingly dead, he is the most wretched of mortals. He is suffering keen hunger, and cannot fill his want, and, under these circumstances, he remembers that his father has bread enough and to spare, and resolves to go to his father. He says: "I will arise and go to my father, and will say unto him, Father, I have sinned against heaven, and before thee, and am no more worthy to be called thy son." Having made this decision, he does not wait to make himself more respectable. It seems that the only way to save his life is to return; for there is bread in his father's house, and he is perishing with hunger. "And when he was a great way off, his father saw him, and had compassion, and ran, and fell on his neck, and kissed him." The father sees before him one who is on the verge of starvation, and with the marks of dissipation upon him; but this does not make him hesitate. He covers him with his own robe. And the son says, "Father, I have sinned against heaven, and in thy sight, and am no more worthy to be called thy son;" but the father brings him into the house, and says to the servants, "Bring forth the best robe, and put it on him; and put a ring on his hand, and shoes on his feet; and bring hither the fatted calf, and kill it; and let us eat, and be merry; for this my son was dead, and is alive again; he was lost, and is found. And they began to be merry." The home looks just as it did when he left it; but what a difference there is in himself. How could he have abused his father's love, and have chosen his own way? The father has no words of upbraiding to offer, and, though the son wept out his repentance, the father thought only of rejoicing, weeping with joy on the neck of his son. The father does not give him a chance to say, "Make me as one of thy hired servants." The welcome he receives assures him that he is reinstated to the place of son. Is not the reception of the prodigal son a representation of the way in which the Lord receives the repenting sinner? In the cross of Calvary mercy and truth are met together, righteousness and peace have kissed each other. Every penitent feels himself enfolded in the arms of the Heavenly Father. There is no taunting, no casting up of his evil course. He realizes that he is met by the Lord--"the Lord God, merciful and gracious, long-suffering, and abundant in goodness and truth, keeping mercy for thousands, forgiving iniquity and transgression and sin." "Now his elder son was in the field; and as he came and drew nigh to the house, he heard music and dancing. And he called one of the servants, and asked what these things meant. And he said unto him, Thy brother is come; and thy father hath killed the fatted calf, because he hath received him safe and sound. And he was angry, and would not go in; therefore came his father out, and entreated him. And he answering said to his father, Lo, these many years do I serve thee, neither transgressed I at any time thy commandment; and yet thou never gavest me a kid, that I might make merry with my friends; but as soon as this thy son was come, which hath devoured thy living with harlots, thou hast killed for him the fatted calf. And he said unto him, Son, thou art ever with me, and all that I have is thine. It was meet that we should make merry, and be glad; for this thy brother was dead, and is alive again; and was lost, and is found." Mark the points in the parable: The elder brother coming from the field, hearing the sound of rejoicing, inquires what it all means, and is told of the return of his brother, and how the fatted calf has been killed to provide for the feast. Then is revealed in the elder brother selfishness, pride, envy, and malignity. He feels that favor to the prodigal is an insult to himself, and the father remonstrates with him, but he will not look upon the matter in the right light, nor will he unite with the father in rejoicing that the lost is found. He gives the father to understand that, had he been in the father's place, he would not have received the son back, and forgets that the poor prodigal is his own brother. He speaks with disrespect to his father, charging him with injustice to himself, while he shows favor to one who has wasted his living. 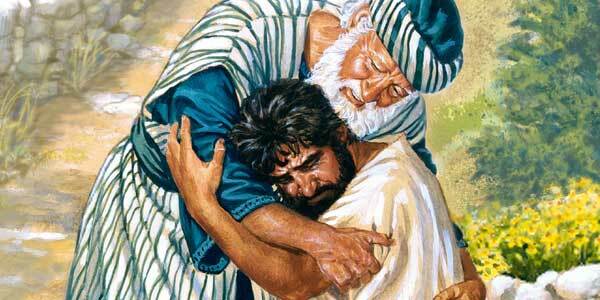 He speaks of the prodigal to his father as "this thy son." Yet, notwithstanding all this unfilial conduct, his expressions of contempt and arrogance, the father deals patiently and tenderly with him. He presents before the elder son the facts of the case, and vindicates his course of action toward the returned wanderer, and seeks to awaken tenderness in the heart of the brother. Did the elder son finally come to see his unworthiness of so kind and considerate a father? Did he come to see that, though his brother had done wickedly, he was his brother still, that their relationship had not altered? and did he repent of his jealousy, and ask his father's forgiveness for so misrepresenting him to his face? How true a representation was the action of this elder son of unrepenting and unbelieving Israel, who refused to acknowledge that the publicans and sinners were their brethren, who should be forgiven, and should be sought for, labored for, and not left to perish, but led to have everlasting life! How beautiful is this parable as it illustrates the welcome that every repentant soul will receive from the Heavenly Father! With what joy will the heavenly intelligences rejoice to see souls returning to their Father's house! The sinners will meet with no reproach, no taunt, no reminder of their unworthiness. All that is required is penitence. The Psalmist says, "For thou desirest not sacrifice; else would I give it; thou delightest not in burnt offering. The sacrifices of God are a broken spirit; a broken and a contrite heart, O God, thou will not despise." "Blessed is he whose transgression is forgiven, whose sin is covered. Blessed is the man unto whom the Lord imputeth not iniquity, and in whose spirit there is no guile." "I acknowledged my sin unto thee, and mine iniquity have I not hid. I said, I will confess my transgressions unto the Lord; and thou forgavest the iniquity of my sin." "Wherewith shall I come before the Lord, and bow myself before the high God? shall I come before him with burnt offerings, with calves of a year old? Will the Lord be pleased with thousands of rams, or with ten thousands of rivers of oil? shall I give my first born for my transgression, the fruit of my body for the sin of my soul? He hath showed thee, O man, what is good; and what doth the Lord require of thee, but to do justly, and to love mercy, and to walk humbly with thy God?" The Signs of the Times - January 29, 1894.